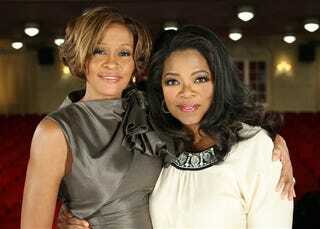 So now we know, thanks to Oprah: Crack remained wack, as far as Whitney Houston was concerned. But marijuana laced with cocaine—the better to "level things off”—now that was a different story. Whitney, by her own admission, made a lot of drug dealers very, very rich. But Bobby Brown was her biggest drug of all. ("I was so weak to his love.") And it took her mother to put her back on track. So the Cliff Notes version of Whitney’s world premiere, super-duper exclusive with Oprah, timed to coordinate with Whitney’s new CD, "I Look To You": Yes, Bobby really was as toxic a husband as he appeared to be. (But she really, really, really loved him.) And no, she says, he wasn’t physically abusive. Except, she says, for that one time that he did slap her. And the time she says that he shoved her and spit in her face. But he was, she says, emotionally abusive, and given to expressing himself as an "artiste" by spray-painting scary looking eyes on their bedroom walls—and cutting off the head of a portrait of his wife. And so, she says, she smoked drugs, watched a lot of TV, barricaded herself in her room and read the Bible. A lot. Still, it’s clear that Whitney was a partner in her own destruction. "I married a bad boy," she told Oprah, “… we fought hard and we loved hard." Before their relationship soured, she says, Bobby was a "fly" and "fun," taught her to dance and was a total sweetie. "They don’t have any idea about that sweet, gentle tenderness about him that nobody knew," she tells Oprah, "At home, he was the father, he was very much in control. I liked that." After years of calling the shots in her professional life, she says, she was thrilled to let someone else take charge at home. To be the wife, in all the traditional sense. Call it a portrait of a woman on the other side of hell. It’s hard not to forget all those pictures of a haggard, skeletal Whitney from years past. But today, Whitney looked great—lots of warm, fuzzy, age-friendly lighting didn’t hurt—and seemed like she’d kept her sense of humor intact. Her voice—“The Voice" as Oprah calls it—sounded almost as husky as it did when she had that Good Morning America performance in Central Park. Will the Voice ever return to its former glory? Is this a comeback for real? A cautionary tale with a happy ending? It’s hard to say. But we’ll be tuning in tomorrow for more—Part 2.